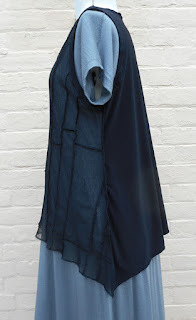 Make the Back vest from plain fabric. For this a square of fabric measuring at least 80cm x 90cm(32x36”) will be needed. 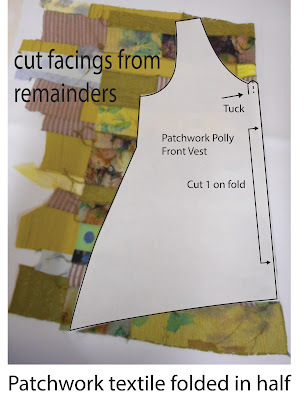 After taping the PDF pattern together cut out the size you require. 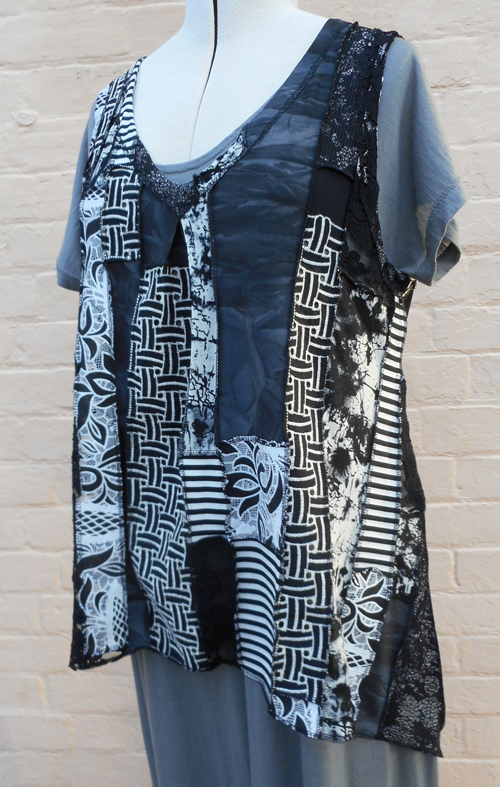 If you want separate patterns for the Front and Back print the PDF twice and cut out each. 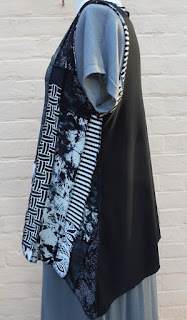 if you only want to print the pattern once, mark and cut out the Back from the fabric with the pattern folded back along the fold line where the pattern piece for the Front extends beyond. 2. 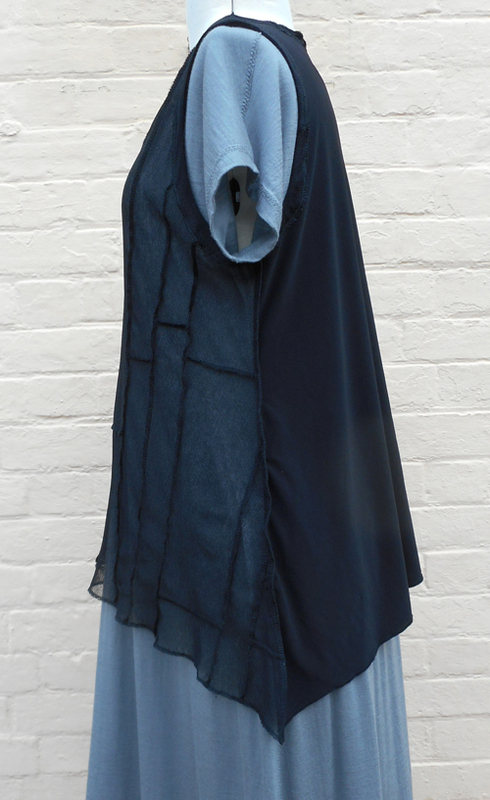 Wrong sides together (with the serging stitch on the outside of the garment) match Front to Back and sew the shoulder seams with 1cm(3/8”) seam, serge the seams. 3. Wrong sides together match and sew the side seams of the Front and Back with 1cm(3/8”) seam allowance, serge the seams. 4. Wrong sides together match and sew the Front and Back facings at the shoulder seams and the armhole facing at the shoulder seams and underarms, serge the seam joins, then the outside edge of the facings. 5. Match the right side of the neck facing to the inside of the vest neckline, matching shoulder seams and sew with 5mm(1/4”) seam allowance. 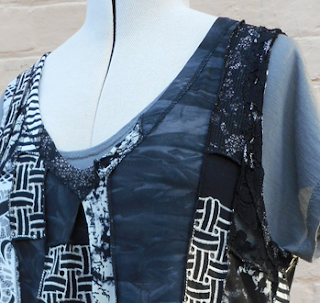 Do the same with the armhole facings. 6. 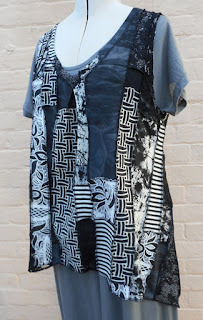 Turn the facings to the right side of the garment and iron. 7. Sew the facings down by stitching through the middle of the serging stitch. 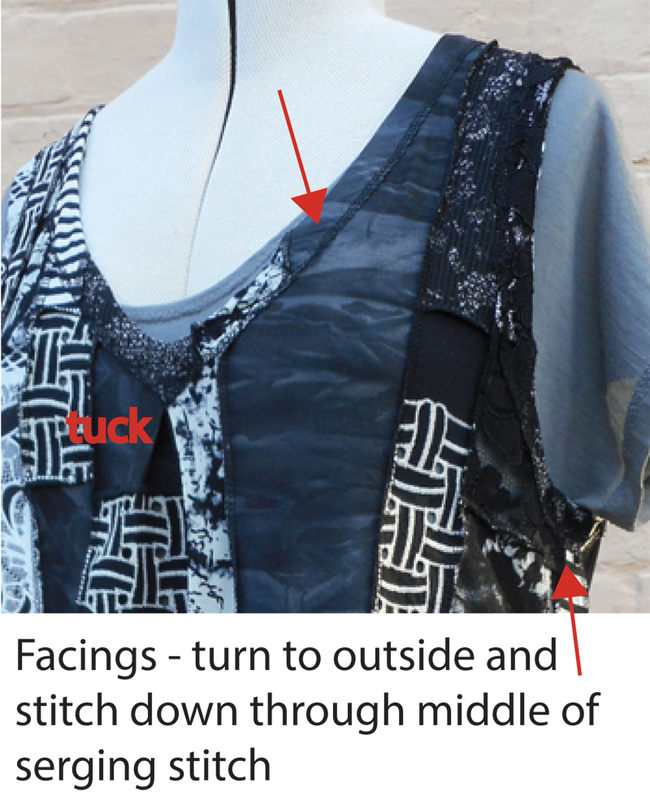 Take care to match the tip of the neck facing to the centre join of the CF tuck when going around the neckline. 8. 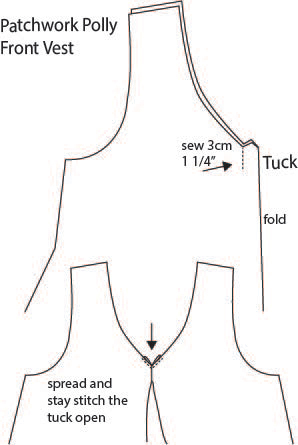 Finish the hem by serging, starting and driving off at each side seam.